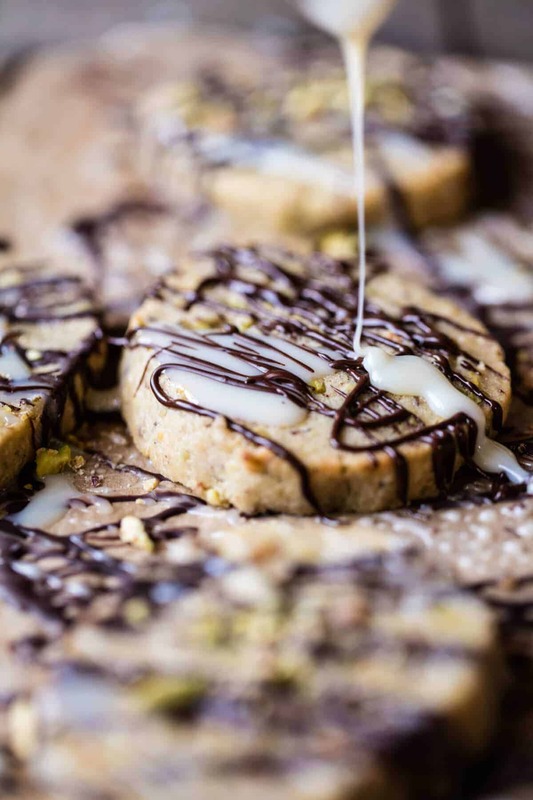 Pistachio Butter Cookies with Chocolate Tres Leches Drizzle. 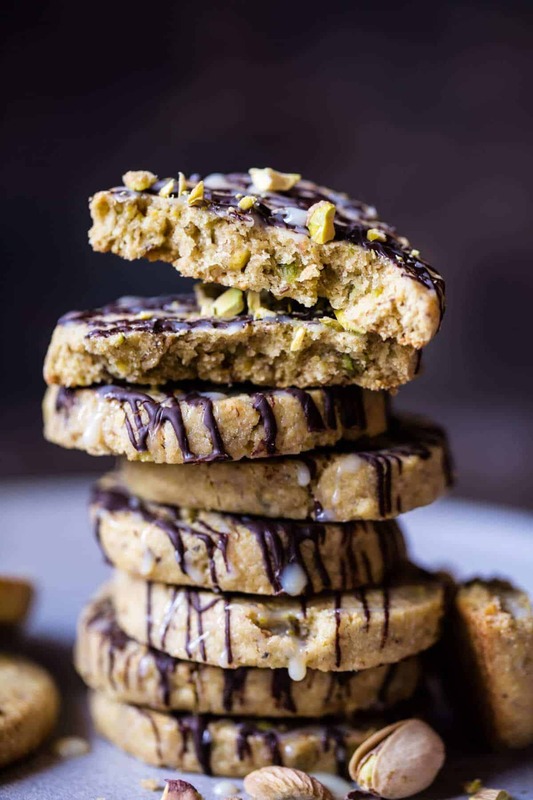 We have so many things to celebrate today…hello pistachio butter cookies! OKok. It’s FRIDAY, it’s ST. PATRICK’S DAY, and we have COOKIES to talk about. You see? So much to celebrate! Cleary I am a very happy about all three of these things. I also love that St. Patrick’s Day falls on a Friday this year. It just makes it all the more fun, you know? Plus I have cookies to share! Yup, pretty much just jumping for joy over here! I think the first topic of the day should be these cookies, sine they are what I am most excited about today. Lately I’ve been having some trouble with desserts. They are just stumping me right now. I’m not sure whether to go healthy, somewhere in the middle, super indulgent, try out crazy flavors…well you get the picture. So basically I can’t make up my indecisive mind. And for today recipe? Well, I wasn’t sure if it should be St. Patrick’s Day inspired, spring inspired, or just an everyday sweet treat. Yes, these are all the things that go through my head. <–insane person. Finally after too much thought and going back and forth, I decided on three desserts that I was going to make and test out, hoping that at least one would be awesome. And then? The best thing happened. All three recipes where so good. YESSS. I had success!! Whoop. Whoop. I plan to share the other two recipes with you guys in the coming weeks, but I knew these cookies had to be shared today. For one, they have a green hue to them, making them the perfect easy cookie to whip up for a last-minute green themed dessert. Two, they are so flipping delicious. 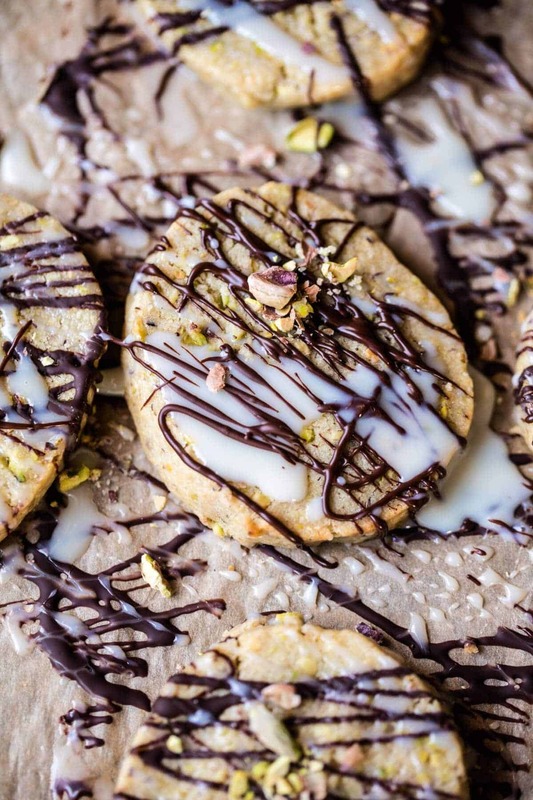 Buttery, salty, loaded with pistachio flavor, drizzled with chocolate, and then drizzled again with sweet milk. 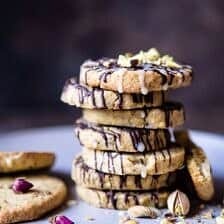 Honestly some of the best shortbread/butter cookies ever, and so super easy too! Slice n’ Bake! 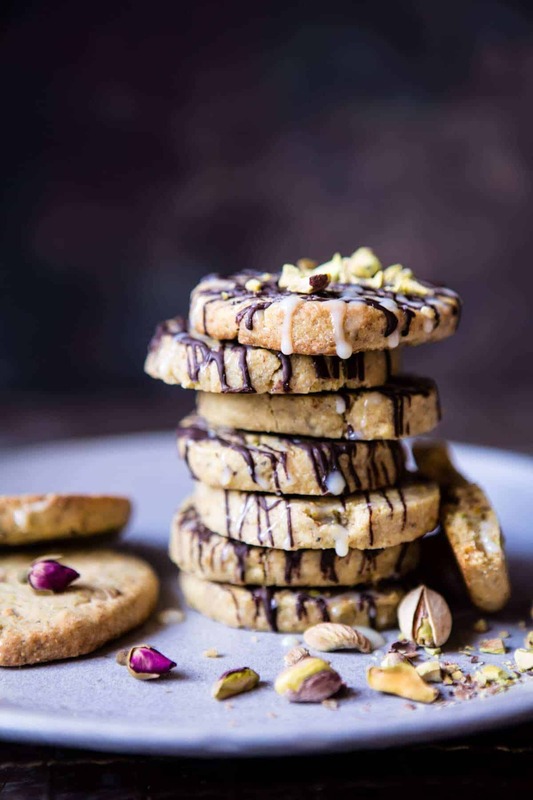 The key to these cookies are quality roasted pistachios and the tres leches drizzle…aka sweetened condensed milk and coconut milk…aka the best thing ever. 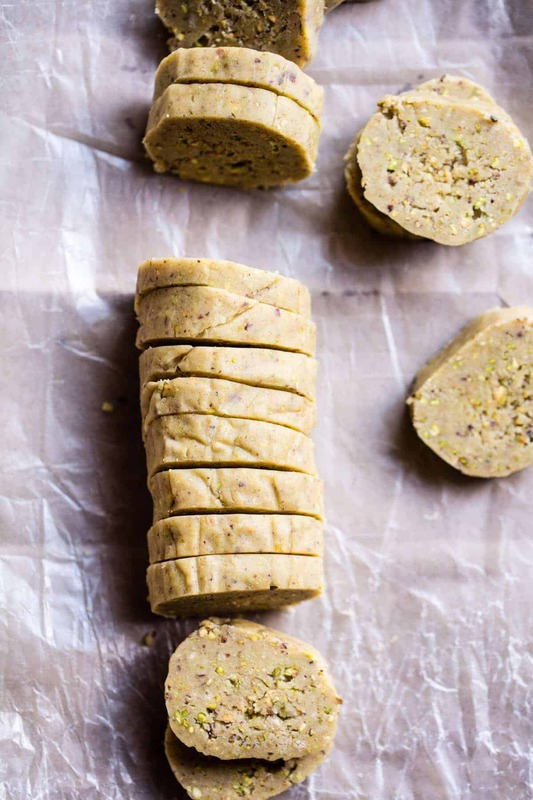 The pistachios are great ground up and mixed into the cookie dough, which also includes plenty of butter and vanilla. The dough gets rolled into a log, sliced and baked. Simple, simple. When the cookies come out of the oven, they first need to be drizzled with the chocolate, and then drizzled again with the tres leches milk mix…and then DONE. 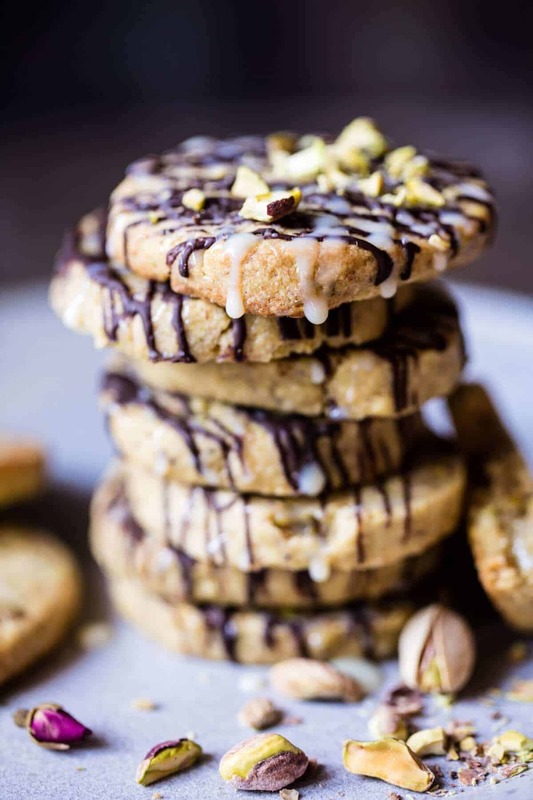 The combo of the chocolate drizzle and tres leches drizzle paired on top of a pistachio cookie is really out of this world. I love the salty, buttery and sweet flavors happening. 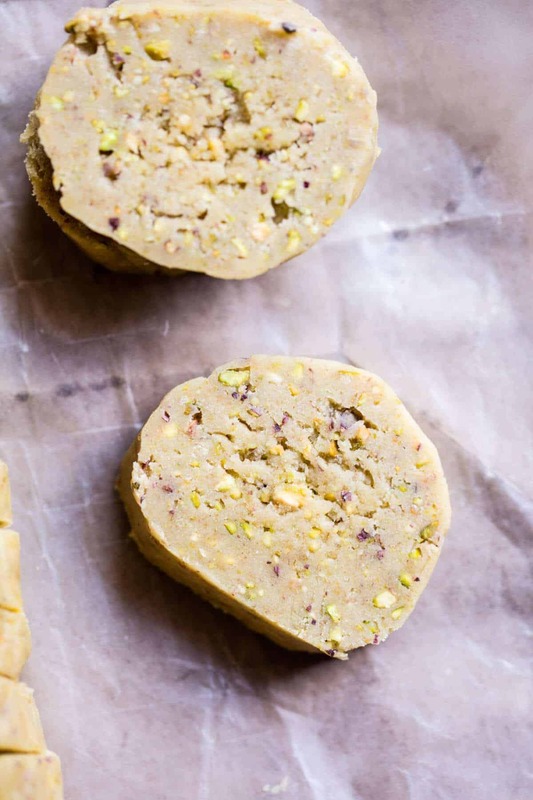 I feel like these Pistachio Butter Cookies are the perfect spring cookie…not too decadent, but still sweet. Plus, the light shade of green just makes them all the more fun! For me personally, cookies are an anytime, anywhere, and any day kind of day treat. BUT then again I have a mother who fed us cookies before dinner, so my view my be slightly off. However, seeing as it’s Friday, and somewhat of a holiday, I’m definitely feeling like cookies need to happen. For everyone. Plus, I don’t know about you guys, but this week was packed full of all kinds of things. It actually started out kind of slow on Monday, but quickly picked up by Tuesday. And today? Well, let’s just say that I really hope to go to bed by midnight…been a lot of late nights this week! BUT first a fun day is ahead! Headed down to Denver today for a meeting. Then I’m taking the rest of the day off and spending some time with just my mom…which never, ever happens. Not sure what we’ll do, but I’m sure some shopping will be involved. Are you guys doing anything fun today? Maybe heading to a party or making some Irish cocktails? How about making some cookies?? <– yes, cookies for sure. I mean, do you see those chocolate covered, buttery, nutty rounds? Like I said, they’re the best…and kind of addicting. <–fair warning. These butter cookies will become your favorite treat! 1. Add the pistachios to the bowl of a food processor or blender and pulse until finely chopped and almost flour like in texture. 2. In a large mixing bowl, combine the pistachios, butter, vanilla, sugar, salt, and flour and mix until combined. If the dough is crumbly, add 1 tablespoon water at a time until the dough is moist and holds together. 3. Place the dough on a large piece of wax paper or plastic wrap. Using your hands, shape it into a log about 12 inches long and about 2 inches in diameter. Wrap the dough up in the wax paper and place it in the fridge for 30 minutes or up to overnight. 4. Preheat oven to 350 degrees F. Using a really sharp knife, cut the log into 1/3 inch slices. Arrange the slices 1 inch apart on a baking sheet. Bake the cookies for 10-14 minutes, the edges will be golden brown. Let cool 10 minutes on the baking sheet. 5. 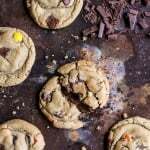 Drizzle the melted chocolate over each cookie and place the tray of cookies in the freezer for 10 minutes to harden. 6 Meanwhile, whisk together the sweet milk and coconut milk in a small bowl. Remove the cookies from the freeze and drizzle with the tres leches mixture. Enjoy! Happy St. Patrick’s Day! Hope your day is filled with Irish Burritos and lots of cookies…and maybe even some Irish Coffee Fudge Brownies too…for extra good luck! 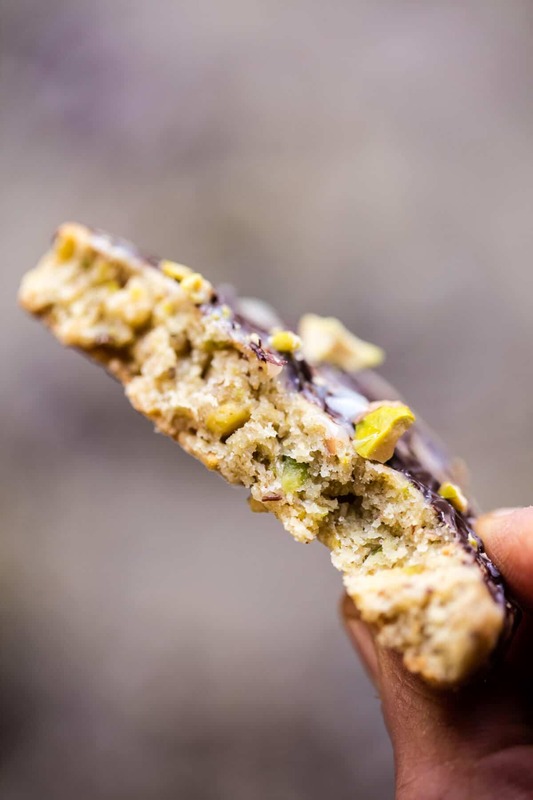 DEFINITELY glad you shared these cookies today – love pistachios & pistachio butter (so underrated). If you ever return to Cleveland, you must try Mitchell’s Toasted Pistachio ice cream 🙂 Happy St. Patrick’s Day! Thank you so much Liz!! I have actually heard that ice cream is super good, but I will have to try it for myself haha! Happy St. Patricks Day to you too! YES! I was skeptical; but when I tried the first bite, the ice cream was a hit. I’m going to try Jeni’s Pistachio & Honey flavor soon as well 🙂 Hope you’re having a great weekend! YAY! SO happy you ended up liking it! Thank you Liz hope you had a great weekend! Love these cookies. They look amazing and super simple. 🍪 Enjoy your day off! Thank you Debs! I am so glad you are loving these! Enjoy your day with your mom. THese scream indulgence!!! I love pistachio, shame it’s so darn expensive or I’d be eatin’ it all the time. I need to bake these soon. Thank you so much Ruth, I hope you love these! I love everything about this cookie Tieghan! Can’t wait to make them! I hope you love these, Kathy! Thank you so much! I’m in love. With your cookie. We’ve never met. I haven’t sampled its deliciousness. But I know love when I see it. I’m all tingly and aglow with anticipation. I can’t wait to finally meet, touch, take a bite. YUM!! Thank you for the introduction. This will be a lifetime relationship. Happy St. Paddy’s Day! I am so happy you are loving these and I hope you love them just as much (or even more) when you try them! Thank you Marisa! This is beautiful dear Tieghan. Thank you ! YUM! Going home to Michigan today for my spring break, and these look like something me & the momma MUST whip up! Perfect! I hope you two enjoy these! These look so good! And I love slice and bake cookies – so quick and easy for a last minute treat! YAY! I hope these turn out perfect for you Libby! 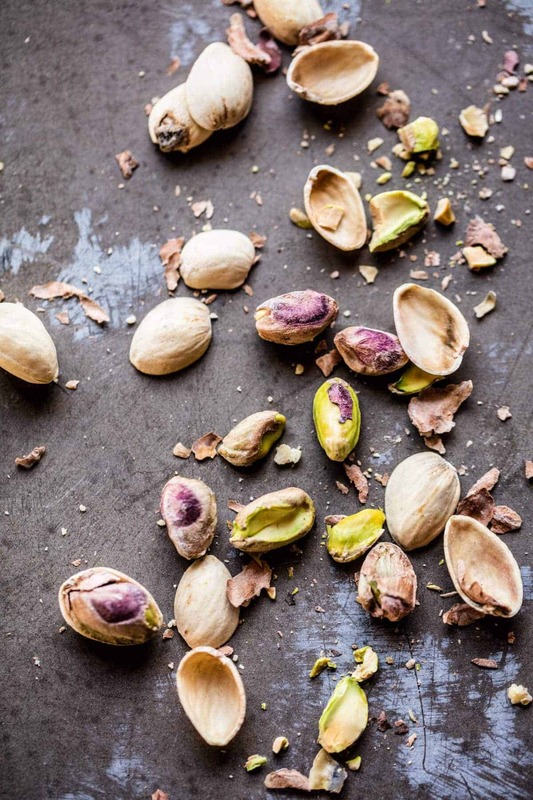 Just to clarify… We leave the shells ON the pistachios before putting them in the food processor?! 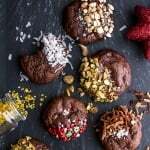 These look delicious, great photos too as always!! YUM!!! I’m not sure they would even get in to the oven–that dough, I would eat it all! Haha I am so happy you are loving these cookies Penny!! Thank you! Cookies with nuts in them are so good. Happy St Patricks day! These look divine! I use salted! Hope you love the cookies! Yum! There is a definite difference in flavor between the pistachios we get from California and ones you order from Turkey. If you haven’t tried an Antep pistachio, you are missing out. These cookies look amazing. I will have to try them! Thank you Nar! Tried them! SUPER!!! Sending some off to a loved one will love them as much as me! Hey! I’m trying to make these, and I just realized that I am really confused on how much flour is needed. Is it 2 and 1/4 cups? Or 4 and a half cups? So sorry! It is 2 to 2 1/4 cups. I used a total of 2 cups though. Only use the extra 1/4 cup if the dough seems wet. hope you love these! I’m in love with these cookies! The pistachio and chocolate combo sounds amazing! Thank you so much Sabrina, hope you love them! I made these cookies over the weekend and loved them so much that unlike most things I bake, I’m keeping them all for myself (no sharing needed!). Loved how they aren’t overly sweet. Plus the drizzles make them look adorable. One of the rare occasions where mine looks just like the blog pics. Definitely worth making. Haha YES! So happy you like the cookies! LOVE when they come out like you want them to! Thank you for making them Rachel! I made the dough last night and it’s fantastic. I’ll be baking and drizzling tonight. Question though, does the tres leches drizzle harden, or stay sticky? 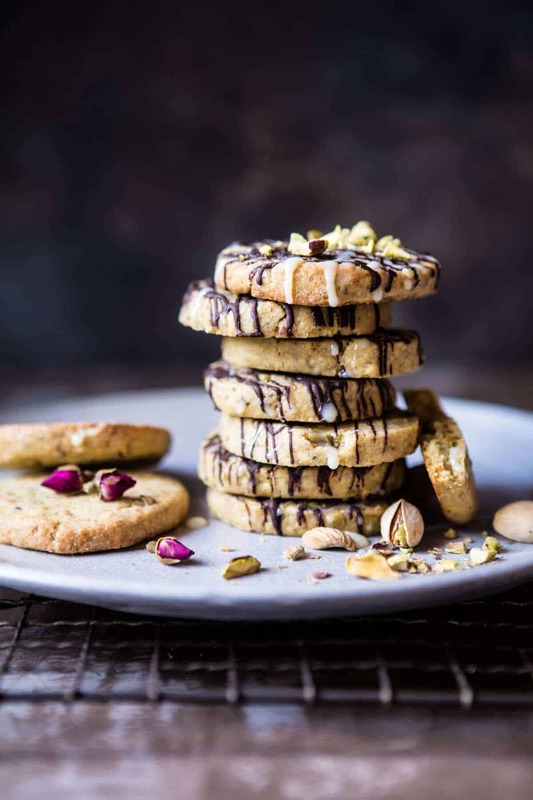 I have been following you last three months and I found out some terrafic recipe from your blog.I was searching pistachio cookies. Because my son like it very much. 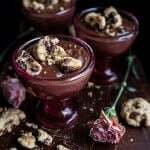 And I found out this recipe and I made it yesterday and belive me my son loved it and he told me to make it every so often.Thanks you again! That is so great! So happy you and your son loved this recipe! Thank you! Does the tres leches mixture then somewhat harden on the cookie or is it liquidy? If you weren’t going to eat these right away, would it be best to wait to pour that over? I’ve never done anything with that before so I don’t want to make the cookie soggy if it will be stored for a few days. Thanks!! Hello! Do these cookies stack okay to be taken to an event? Don’t want to show up with the drizzle everywhere. Thanks in advance! Also, if you have any ideas for a good cookie to stack and travel to Thanksgiving dinner, I would love your input?! HI! They do stack really nicely, yes! 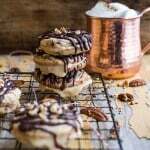 My other cookies have frostings, but these sugar cookies stack well as do these pecans cookies. Hope this helps and I hope you love the cookies! Should the tres leeches drizzling stay liquify (gloopy)? Messy. Hey there! They look amazing! I haven’t tried the recipe yet, but I hope to make the dough ahead of time for an event. How long do you think the cookie dough keeps in the freezer?